Central Jakarta Forestry Sub-dept. 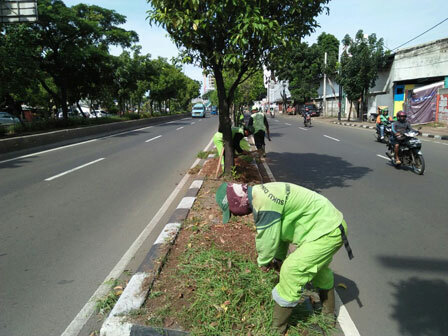 officers began to plant ornamental plants on the green belt of Jalan Pramuka, Rawasari, Thursday (3/8).
" We do it, as the previous separator looked barren. That's why we plant thousands of ornamental plants"
"We do it, as the previous separator looked barren. That's why we plant thousands of ornamental plants," expressed Sabdo Kurnianto, Head of Central Jakarta Forestry Sub-dept. According to him, types of ornamental plants are bougenville, rawelia, palm, lilies and grasses. These seeds are from cuttings and seeding process of Jakarta Forestry Dept. "It is targeted to be completed prior to Asian Games," he stated. Previously similar thing was also conducted along Jalan Ahamad Yani, Cempaka Putih, Jalan Angkasa, Kemayoran and Motik Flyover in front of Kemayoran Guesthouse Athletes. "Hopefully people and stakeholders can maintain and care those plants," he hoped.